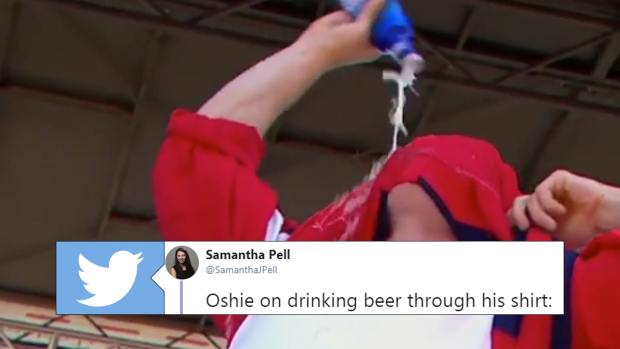 TJ Oshie is often referred to as an American hero and that title probably hit an all-time high on Tuesday when he chugged a beer through his jersey at the Capitals parade. Oshie pulled off a maneuver that looked like it originated at a Bills Mafia tailgate and quickly became one of the stars of the parade (And there were a lot of them). The through-the-jersey chug may have shocked and thrilled fans and audiences, but it’s something the Caps have been seeing all year. Oshie explained that his teammates basically forced him to do it on stage. Oshie seems to be a magician with beer, because he can make it disappear in many different ways. In a more private setting, someone captured a moment where he crushes two beers at once.